Looking for Assistant Professor / Non-Faculty jobs in Engineering Colleges 2019 in Karnataka? or Searching for Faculty Teachers Karnataka January 2019 ? 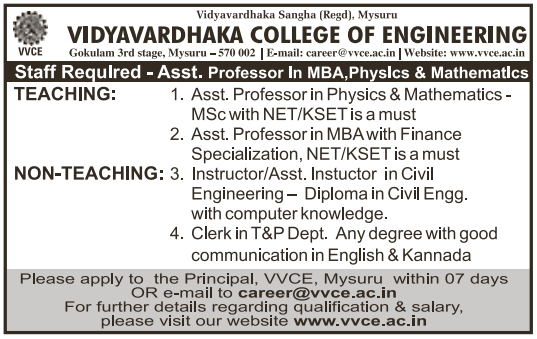 A college based in Mysore named Vidyavardhaka College of Engineering, Mysore has advertised in the DECCAN HERALD newspaper for recruitment of Assistant Professor Plus Non-Faculty jobs vacancies. Interested and eligible job aspirants are requested to apply within 07 days from 23rd January 2019. Check out further more details below. About College: Vidyavardhaka Sangha (VVS) stands as a synonym for quality education in the Heritage city of Mysore. VVS was established in 1949 by great visionaries namely Late Sahukar Channaiah and Late. K. Puttaswamy (Former Minister of Karnataka) to impart quality education to all sections of the society. There are ten educational institutions starting from nursery to engineering college under the aegis of VVS. At present, Sangha is under the able guidance and leadership of Sri Gundappa Gowda, President and Sri P. Vishwanath, Secretary.